For probably the first time since 1933, an organized Jewish boycott of German products has been called. The reason: Lufthansa's admission that Israel is the only country in the Middle East that cannot benefit from the German airline's special baggage allowance policy. 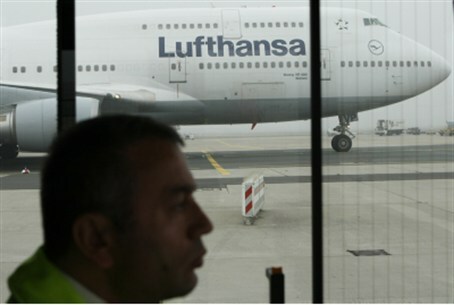 The Zionist Organization of America (ZOA) is now officially urging travelers not to fly Lufthansa because of its discrimination against Israel and against travelers to Israel. As Lufthansa's website explains, Economy Class travelers are permitted one free bag or suitcase of up to 23 kilograms (50 pounds). However, a special baggage policy exists for those traveling to "the United States, Canada, Mexico and Afghanistan, Bahrain, Egypt, Iran, Iraq, Jordan, Kuwait, Lebanon, Oman, Pakistan, Qatar, Saudi Arabia, Syria, Turkey, United Arab Emirates and Yemen." The more generous policy, which allows two suitcases (up to 23 kilograms each) free of charge, conspicuously excludes travelers to and from Israel. Perhaps this was merely an oversight? The ZOA wrote to Lufthansa this past May, asking for an explanation for the policy: "We hope that Israel's omission was merely an oversight and was not done intentionally. If it was intentional, it would clearly constitute anti-Semitism." Despite the chance it was given to rectify the mistake and the anti-Semitism it appeared to reflect, Lufthansa jumped away from it. The ZOA reports that Lufthansa, in its response, did not dispute or justify the existence of the policy, though it denies that it is discriminatory. Instead, the German airline referred vaguely to baggage allowances that are "based on economic and commercial factors," offering no explanation as to how these factors identically affect every Arab/Muslim country in the Middle East, but not Israel. ZOA then wrote again to Lufthansa, urging it to include travelers to Israel in its special baggage policy. No response was forthcoming. The ZOA is thus calling on all concerned individuals to boycott Lufthansa, Europe's largest airline, until its anti-Semitic policy is changed. The last time an organized Jewish boycott of German goods took place was shortly after Hitler rose to power in 1933. In March of that year, despite some opposition within the American Jewish leadership based on fears for the safety of German Jewry, the American Jewish Congress and others convened simultaneous anti-Nazi protest rallies at Madison Square Garden in New York, Chicago, Boston, Baltimore and over 70 other locations. Later, the Jewish War Veterans renewed their call for a boycott of German goods, and other Jewish organizations soon joined them.